To determine the efficacy of cognitive targeted prostate biopsy using biparametric magnetic resonance imaging (b-MRI) for patients with PSA level under 10 ng/ml. We reviewed data from 123 consecutive patients who underwent cognitive targeted prostate biopsy using prostate MRI. 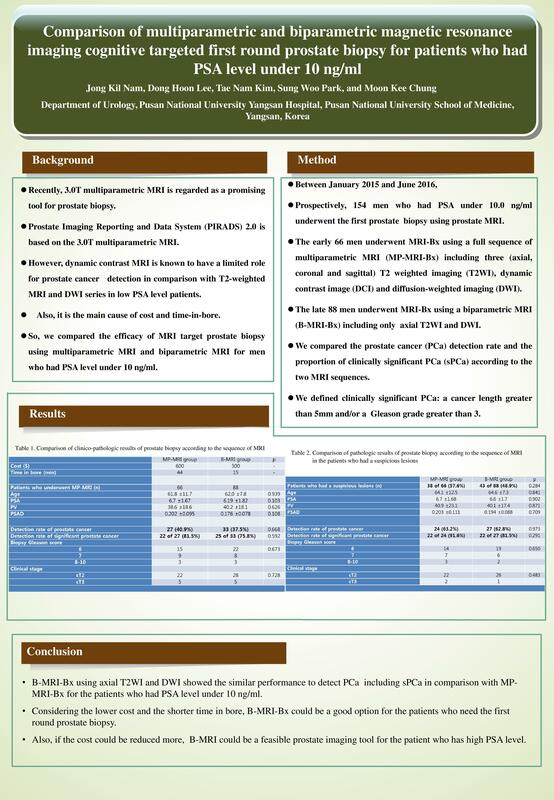 Of these patients, the first 55 underwent prostate biopsy using multiparametric MRI (mp-MRI), and the remaining 68 underwent prostate biopsy using b-MRI. For b-MRI, we performed T2 weighted axial imaging and diffusion-weighted imaging sequences. We found that 62 of the 123 men had suspicious lesions on MRI (32 of the 55 men in the mp-MRI group and 30 of the 68 men in the b-MRI group). We compared the prostate cancer detection rates and the proportions of clinically significant prostate cancer between the different MRI sequences. Between the two MRI groups, there were no statistically significant differences in prostate cancer detection rate and proportion of clinically significant prostate cancer (41.8% vs. 30.9%, p=0.208 and 82.6% vs. 76.2%, p=0.598). Among the 62 men who had suspicious lesions on MRI, the prostate cancer detection rates were 62.5% and 63.3% (p=0.709) in the mp-MRI and b-MRI groups, respectively, and the proportions of clinically significant prostate cancer were 95.0% and 84.2% (p=0.267). Prostate biopsy using b-MRI showed similar performance to that using mp-MRI for prostate cancer detection and clinically significant prostate cancer detection. Considering the satisfactory performance and cost effectiveness of b-MRI, this technique could be a good option for obtaining intraprostatic information for first round prostate biopsy.